I love these stamps btw. Especially the compost one. I wonder if they do anything but advertise being green? 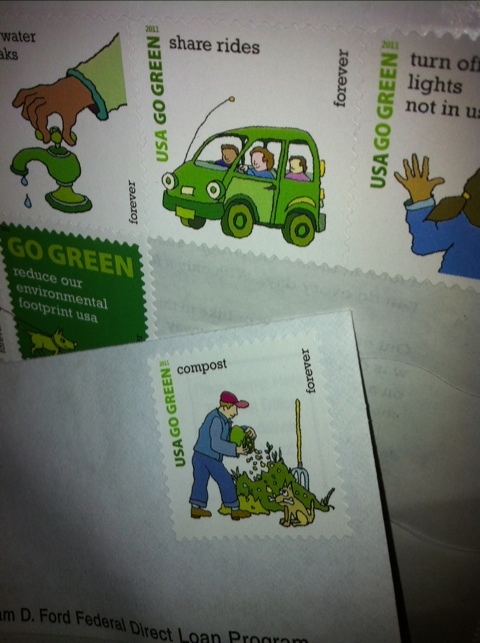 Like maybe they could be made of compost, or specially decomposing material (but maybe they couldn’t be forever stamps)? Maybe there’s some incentive for the gov’t to do it! Then again, maybe forever is revokable if the post office gets sold to UPS, Fedex or GE. Or if it just lays off enough workers that the new motto is snow? Rain? Heat? Fuhgeddaboudit. I love those stamps too and also blogged about it. Hopefully the customers will read the stamps and get ideas from it. Fall planting, Round Up woes, a win for organic farmers, and Monsanto gets a taste of it’s own medicine. Listen through the ‘chit chat’, it’s a worth while episode. August 9, 2011: Bright moonlight streams through your window. A nugget of space debris disintegrates in a sparkling fireball. A huge spaceship glides silently overhead. By itself, any one of these events might be enough to get you out of bed. This weekend, all three are going to happen at the same time. On August 12th and 13th, as the Moon waxes full, the International Space Station will glide over US towns and cities during the peak of the annual Perseid meteor shower. Back then, they washed the baby’s diapers because they didn’t have the throw-away kind. They dried clothes on a line, not in an energy gobbling machine burning up 220 volts – wind and solar power really did dry the clothes. Kids got hand-me-down clothes from their brothers or sisters, not always brand-new clothing. Cobblers repaired their shoes, so they lasted decades. Went out back about 4am this morning. Me, the crickets, and my garden still resting up for the day ahead. Looking up I got to see some neat meteors, most streaking toward the south. One, somewhat slower heading east, and one that was just a flash, like a tiny flash bulb going off. Check it out tonight if you can. Try to get to a darkened place. Who knew the garden got to see shows like this so many times while I was asleep.